At Banksia Park Puppies, we know that your puppy becomes part of your family when it leaves our family here. For this reason, we have started something fantastic for all our new Banksia Park Puppy families. Now when you pick up your puppy you will also receive a detailed,personalised, Puppy Record Book. It has details and photos on mum, dad, puppy and siblings, as well as photos and information about where your puppy grew up and mum and dad live. We hope that this Record Book will be treasured and give you lovely memories of your dog as a young puppy. Below is some example pages of our books! Note: the images are a sample, and the information is not real. You will have information on the mum and dad of your puppy, and links to more photos. Banksia Park – Where did your puppy come from? 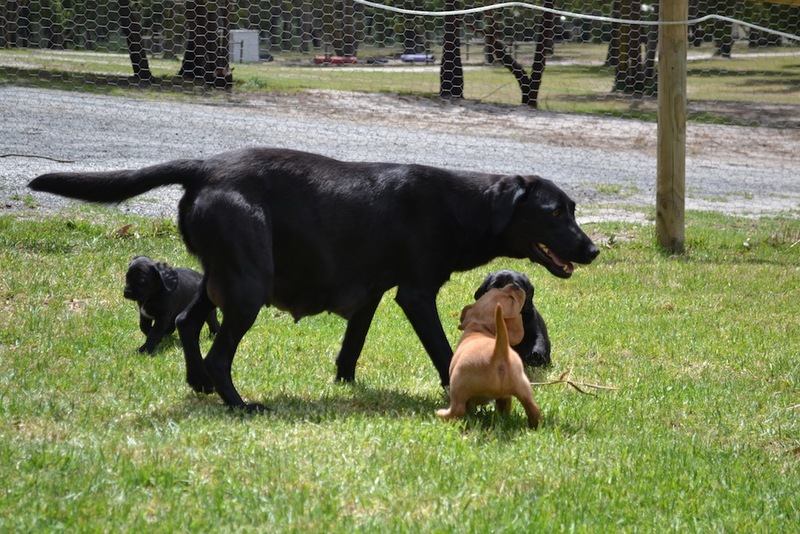 Banksia Park Puppies – Where did your puppy come from? Interested in where your puppy came from? If you want to know more about Banksia Park Puppies, this 10 minute documentary will tell you all there is to know. It shows the live in yards, the heated nurseries, the Veterinary care, choosing through Pines Puppies, and then all the way through to our re-homing. Why isn’t my puppy the same colour as it’s parents? At Banksia Park Puppies, we get a lot of questions about a puppy’s colouring, relating to the colour of it’s parents. These are questions like ‘why is my puppy’s coat gold when both of it’s parents are black?’ or ‘my puppy is golden but it’s parents are red, how can this be the case?’. I would have to go into significant scientific gene detail to completely answer these questions! But I also would like to address the question, and give you enough detail so that you can understand why a puppy’s coat is random rather than a certainty based on it’s parents. Every puppy has DNA. This DNA is made up of a whole lot of different ‘points’. Each of these has two parts that make this up, and these can be ‘dominant’ and/or ‘recessive’. When mum and dad breed, each parent passes on one of their DNA to make up the DNA of the puppy. The gene passed on is picked at random. Each of the puppies (even within the same litter) will therefore be made up of a random set of DNA from mum, and a random set of DNA from dad (the figures below will help you understand this!). We’ll talk first about how a dog can be black or liver (for the sake of making this the basics, we’ll show liver as brown). This depends on the ‘B’ part of the DNA. ‘B’ is dominant over ‘b’. So depending on the genetic makeup, if black mum and black dad both have a recessive ‘b’ gene (i.e. they are Bb), the puppies actually have a possibility of being liver (or another colour other than black) as they could get the ‘b’ gene from mum and dad, making then ‘bb’. Recessive red adds an additional complexity, to make this simpler, we will only use the two recessive red genes ‘E’ and ‘e’. 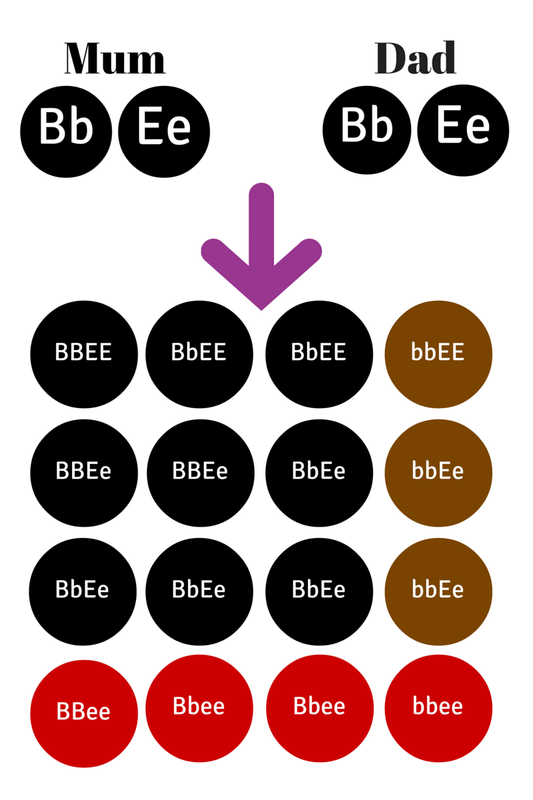 E – this basically means that whatever their colour as determined by other genes (e.g. B) will occur. e – The dog cant produce the black colour, it will produce a red/tan colour instead. So putting B and E together, a puppy with the following make up will have the below colour. 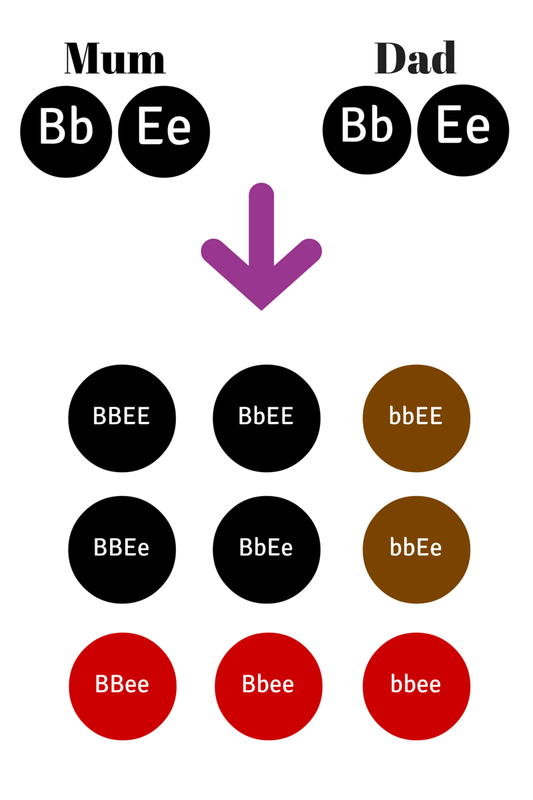 Here is one of the more complex examples of ‘B’ and ‘E’ together, and it shows the possibility of the colours of their puppies, and the different resulting genes. Duplicating genes haven’t been shown in the first example, so this doesn’t show the ‘chance’. Figure below shows the ‘chance’ of a puppy being a certain colour with duplicating genes shown. NOTE: Just a note that this blog article doesn’t take into account many the other genes i.e. whether white patching will occur or the intensity of the colouring to create red/tan/yellow. It is put together as a simple description to show customers that puppy may not always be the same colour as mum and/or dad. Has anyone else noticed the rise in dog related activities and products? Having a dog in today’s society doesn’t just mean that we have one in our backyard; having a dog now means that we take them to our favourite cafes for a cup of coffee and the good cafes even have menus for our paw friends. We take them on our walks around town to do shopping, and even on winery tours (see Gourmet Paw Prints who specialise in exactly this)! They live inside, in apartments with courtyards, and now have car seats in between our children in the back seat. 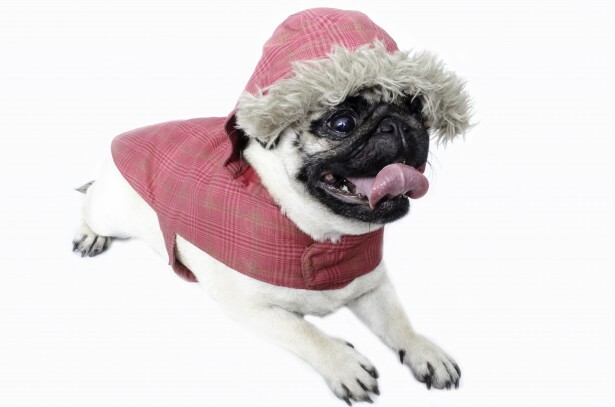 The dogs in our life now have specially designed clothes (like the cute puppy in the photo! ), dog bowls and toys individualised for them, doggie day care if their carers are at work during the day, and dog ‘resorts’ for when their carers go on holidays. This all just shows how much our dogs now mean to us. They really become part of our lives. This is the predominant reason that we at Banksia Park Puppies and Pines Pets breed the dogs that we do. The dogs we breed are low allergenic, low shedding, are softly tempered, and still love exercise and absolutely adore their owners. At Banksia Park Puppies we specialise in cross breeding; we do this so that the puppies who join your family will fit perfectly into your family life. For example, our Cavoodles are King Charles Cavalier (usually the mum), and a Miniature or Toy Poodle (usually the dad). This breed of dog fits perfectly into family life. They have extremely low shedding coats which is great for inside the house, or for children with allergies (thanks to the Poodle) and are beautifully tempered for inside the home and with children (thanks to the King Charles Cavalier). They will walk on a lead, sit at your cafe for a coffee or a paw-treat from the doggy menu, and play with your children outside chasing balls or toys. Our Banksia Park Puppies are beautifully tempered, well socialised, and we have a group of full time staff looking after them at our property to make sure that when your puppy joins your family, he or she fits perfectly into your life. Our website explains further the breeds that we specialise in or contact Pines Pets for help on choosing the right breed for your lifestyle. Note: There is no affiliation or endorsement from Gourmet Paw Prints.